One of the reasons why many people choose to learn to play ukulele is because it’s so small and easy to carry around when you travel. When you go camping with your friends you already have to carry a lot of stuff and guitars are bulky and impractical for this kind of trip. On the other hand, ukes are small, lightweight, and they still sound awesome. However, not every ukulele is practical for traveling and there are some things to take into consideration when choosing the best travel ukulele. Advanced Tuner: 1:18 Pure Copper Gear (rather than poor quality brass-plated zinc alloy); Finer and More Stable Tuning; Ensures the Ukulele the Best Intonation, Stays in Tune for Longer Times. 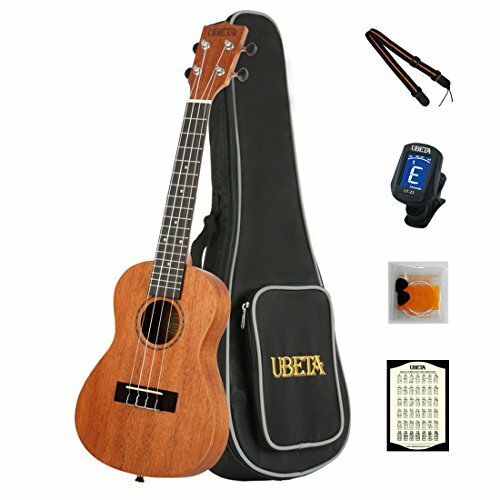 Super Ukulele: Lower Action for Easy Play without Buzzing; Special Fret Wire to avoid Scratching; Aquila Strings to create a Full Sound; Strengthened Neck and Soundboard to ensure Quality and Durability. One of the most important features of the best travel ukuleles is the thinner body. Standard ukuleles usually have the bodies that are 3.5 to 4 inches thick while the travel ukes have bodies that are 1.5 to 2.5 inches thick. This makes it much easier to travel with since you can pack it in your backpack or carry-on bag. Travel ukuleles usually come with geared tuners. The geared tuners are very reliable and they usually hold the tune perfectly which is quite convenient for traveling. The only downside of these ukuleles is the price. They usually come with a higher price tag and can be too expensive for some people. So it’s recommended to buy an ukulele only if you travel a lot or if you are limited on space. Also, the sound of ukulele lacks overall depth and volume, but some people actually prefer that while some consider it a downside. The first thing to consider, like with most of the instruments, is the price. Travel ukuleles are usually more expensive because they were built with more precision because they need to be more compact. You can find the best travel ukulele for around $100, but most of them cost above $150. Another thing to consider is what size ukulele you want. A small soprano uke is great for traveling and it will give you the best flexibility, however, if you want a bit deeper sound, you might want to go with a bigger one. If you happen to be on a really tight budget and you want a durable instrument, you might want to consider getting a plastic ukulele. You have to think about how often you will bring your ukulele with you. 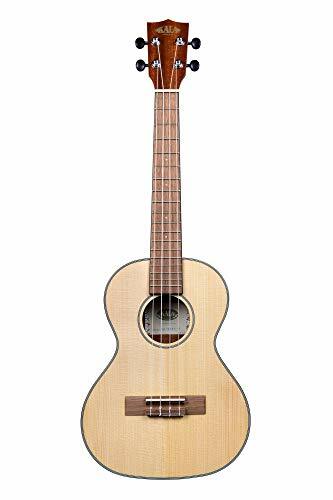 If you need an instrument that you will casually play whenever you meet with your friends, you’ll probably be good with standard soprano ukulele made of softer wood. However, if you travel a lot and you carry your instrument with you, you might want to consider an instrument made of harder wood so you can get louder and clearer sound. Another important thing is the environment you will be playing your uke. If you take your ukulele everywhere you go, it can get wet which can cause some serious damage to it. If you want a ukulele that you can take on the beach or play it by the pool, then we recommend that you go with the ukulele made of polycarbonate plastic. Plastic ukulele might sound unplayable, but trust us, there are some really good and sturdy models out there. Easy to carry and water resistant instrument is, in our opinion, a very good traveling instrument. Bad weather can be devastating to any instrument, not just ukulele. If you plan on playing outside in the areas prone to rain or even fog, we recommend that you don’t go with a too expensive instrument made of high-quality tonewood. Water can affect wood very much. Exposure to water can cause your instrument to warp and that can ruin the finish and most importantly the sound of your instrument. Furthermore, humid weather can lead to rusting of machine heads and frets on your ukulele, which makes it hard to play and you risk potential injuries. Although all ukuleles are generally lighter than guitars, there are some major differences in the weight of ukuleles. Style of the ukulele plays a big part in this. Soprano ukes are the lightest, while the tenor and baritone are a bit heavier. Furthermore, harder wood is heavier. For example, mahogany will be heavier than any softer wood, while the both of them will be heavier than a composite material. It might not sound like much, but sometimes even one ounce makes a difference when it comes to transport of your instrument. Also, acoustic-electric ukuleles will be heavier than acoustic ones because they have electronic components inside. If you want to be as mobile as you can, you will probably go with full acoustic uke. Finally, if you plan on traveling a lot, we highly recommend getting a gig bag. The gig bag will protect your instrument from the elements and other debris, and it’s much easier to carry your uke around in a gig bag. If you travel really frequently, we recommend a hard shell case because it will protect your instrument against scratches and dents as well. The UC-031 is a great travel instrument for beginners. This instrument has really great features while maintaining a very modest price. Since it’s for the beginners, it comes with a lot of great goodies such as a strap, strap pins, tuner, gig bag, and chord charts. There are a few different models to choose from and some of them even come with a Piezo bridge if you want to play plugged into an amplifier. The uke sounds a bit thinner than most of the regular ukes. However, it has a round back side that allows better resonance and bright and warm tone. It’s not really what you will call the greatest ukulele, but it sounds fairly decent for a model of this price. The strings offer a good sound and they stay in tune and the wood is quite sturdy and it looks nice. The quality of the additional gear is not really a top notch, but in this price range, you can’t ask for more. The ukulele itself is very nice and it sounds nice and everything you get with it is a nice bonus. The uke requires a setup before you start playing it because it comes with a bit high string action. The soprano ukuleles are the most travel-friendly ukuleles out there and this particular model is one of the lightest you can find. The Kala KA-SSTU offers a very nice sound, although not very loud and a bit shallow when compared to Kala’s tenor version of this model. You can add a low G if you want to address this as a problem, but tuning it to a baritone is impossible. However, the sound is quite punchy and bright and we think that it’s quite good since you will use it as a travel instrument and play it on a beach or something like that. You won’t use it for big performances. Overall, it does its job nicely. The tuners on this uke are great and they hold the tune perfectly. All of the parts are very modern and in combination with the traditional scale length they result in a unique playing experience. This uke is great for people with smaller hands and children. It’s not the sturdiest ukulele you will find and it requires a delicate touch. It’s very comfortable to play and the neck is excellent. The only thing it lacks is a pair of strap buttons. You don’t really need a hard shell case because this instrument is made to be perfectly transportable. It’s thin, short, light, and it comes with a gig bag. This is a perfectly balanced instrument with an excellent blend of quality and affordability. Let’s be clear, it is not a professional instrument, but it’s a perfect ukulele for holidays and traveling. The response rate is very solid and the sound is great. It has a beautiful and clear natural sustain. It’s a nice thin instrument with full sound and quite a unique sound hole which makes it very recognizable. What gives this instrument such a nice and crisp sound is a combination of Aquila Nylgut strings and the bone nut. Of course, the sound is a bit thinner than with bigger ukes. This nice ukulele features a great design that doesn’t have any negative effects on the tone. It’s very well made instrument and only the high-quality wood (spruce top and mahogany sides and back) is used for the production. The bone nut is also of very good quality. When it comes to downsides, there are not many. The tuners could be better though, and the uke feels a bit rough. It’s very compact and it can easily fit into your backpack, which is very convenient since it doesn’t come with a gig bag. It’s a bit pricier but it’s still affordable and it offers a great value for the price. This here is a hybrid instrument. The technical term for this is guitalele. Now, you can view it either as a ukulele with additional two strings in the lower register or as a smaller guitar that is tuned 5 semitones higher. This guitalele comes with a gig bag and it’s made of high-quality materials. Now, in order to keep the unique sound, the instrument comes with custom Aquila strings that are tuned in A, but if you wish, you can request a set for E tuning. Now, beginners and some players who are used to four-string ukes might be a little bit confused by the two additional strings, but you can remove those easily if you want. The instrument has a recognizable ukulele sound with two additional bass strings that make chords sound fuller. It’s very loud and giver an incredible sound despite the fact that it’s much smaller than a standard guitar. It comes with a piezo pickup and preamp so you can plug it into the amp and perform in front of an audience. This combined with instruments transportability makes it great for abroad performances. It looks very nice and it features a cut-away so you can reach the higher frets. Solid mahogany neck and rosewood fretboard feel very comfortable and it’s incredibly easy to play this instrument. The instrument is very thin; however, it’s bigger than most of the others which make it a bit more difficult to carry around. The size resembles the size of a baritone ukulele. Kala is a well-known company and they have become masters of great yet affordable ukuleles. This particular model is a tenor ukulele packed with features while remaining very compact. It features an exquisite hardware, top-quality parts, and it comes with a gig bag. The ukulele itself is very thin yet the sound is quite loud. The tone is great but somewhat thin and the strings stay in tune for a long time. If you want to improve the sound you can replace the G string with low G, but that’s not really necessary. The great thing about tenor uke is that you can tune it as a baritone if you wish while keeping a small size. This uke is not really sturdy, but that was to expect for such a low price. It has a very comfortable neck and die-cast tuners that keep your uke in tune perfectly. The only downside is the lack of strap buttons because it’s a bit hard to hold such a thin instrument while standing up. When it comes to transportability, tenor ukuleles are usually avoided, but this one is so thin that it makes an exception. The gig bag allows you to carry it around and if you wish, you can easily pack it in your backpack. Choosing a proper travel instrument is hard and stressful because there are so many factors to consider. However, if you know what to look for it might not be that hard. In our opinion, the clear winner is the Kala KA-SSTU Travel Tenor Ukulele. It has everything a travel instrument should have. It’s very light and thin and extremely easy to carry around. Despite its thin body it still produces full and warm sound and can easily be tuned in different tunings. Most importantly, it’s cheap. You don’t want an expensive instrument to carry around on your camping trips, right?